Liberals have made it clear over the last year and a half that they absolutely hate President Donald Trump with the heat and intensity of a thousand burning suns. So deeply entrenched in their souls is this hatred that they will oppose him on every front, regardless of whether it ultimately benefits them or not. Yes, they are totally willing to go against policies of his that actually help them, essentially speaking out against their own interests. In a world where men pretend to be girls, this sort of insanity is no longer surprising. 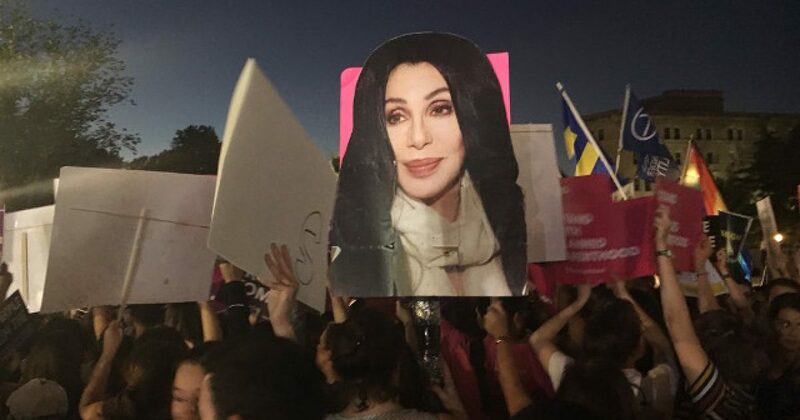 Last night, as the president was gearing up to reveal his Supreme Court nominee, leftists protesters were showing up outside the building, ready to speak out against whoever he chose, and they came completely prepared. There was one problem, though: the White House remained tight-lipped on Trump’s choice, and without a leak, the protesters had to come prepared for any inevitability. Under the clear assumption that any nominee would be, by definition, an affront to their “human rights,” demonstrators carried fill-in-the-blank signs and fistfuls of markers, so that they could make appropriate placards on the spot. Are these not the most obnoxious individuals you’ve ever seen? It’s seriously deplorable how much these folks hate our president. It’s understandable if you disagree with him or don’t like him personally, but he’s the commander-in-chief and should have at least a little respect from folks. Especially since he hasn’t done anything illegal since his time in office. Then again, the left is always looking for something they can protest so they can try and recapture the “glory days” of the hippie generation, which is something they desperately crave for some reason.